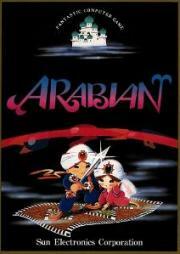 Arabian is a platform arcade game created in 1983 by Sun Electronics and published by Atari Inc. The player assumes the role of an adventurous Arabian prince whose goal is to rescue the princess from her palace. During his quest, the prince will sail seas, crawl through caves, and fly magic carpets. OK enough platformer from the initial batch of Donkey Kong inspired titles.